Acne is the most common skin condition in the United States. It typically begins around puberty when hormonal changes stimulate the production of oil, or sebum, in the sebaceous glands of the skin. Clogging of the pores by excess sebum, dead skin cells, and bacteria then causes the formation of acne bumps, which may take the form of white heads, black heads, red bumps, pustules, or cysts. Acne severity will vary from person to person; breakouts may be occasional and mild, or if dealing with cystic acne it may consist of very large, painful, red and draining cysts that heal with scarring. Acne blemishes, discoloration, blotchiness, and scars can be a significant source of distress for many people, especially during adolescence. While acne severity tends to lessen as a person leaves the teenage years, some women in particular will continue to suffer from acne breakouts into their 20s, 30s, 40s and beyond. These women are genetically predisposed to hormonal breakouts because their sebaceous glands are more sensitive to stimulation by testosterone. Hormonal acne may worsen with menstrual periods, hormonal contraceptives, pregnancy, polycystic ovaries, or stress. Fortunately there are many effective treatment options available for all types of acne. The primary goal is to maintain clear, healthy skin, boosting self-confidence and avoiding scarring. Some patients do well with a regimen consisting of washes and/or creams, while others require treatment with short-term oral antibiotics, oral contraceptive pills, or non-hormonal anti-androgen therapy. Severe or resistant acne may be safely and effectively be treated with isotretinoin (Accutane). Other forms of treatment would include skin peels, red light therapy, blue light therapy, and laser. Treatment for red and brown discoloration as well as acne scarring is also available. Rosacea affects at least 16 million people in the United States and is most commonly found in those with fair skin. The cause of the condition is unknown and appears to be influenced by a complex set of environmental and genetic factors. Possible causes include defects in the immune system, nervous system, blood vessels of the skin, bacteria on the surface of the skin, and Demodex mites. Unfortunately there is no cure for rosacea but there is a wide range of treatment options available for all of its frustrating symptoms. Identification of rosacea triggers can be helpful in controlling flares. The most common would be sun exposure, emotional stress, hot or cold weather, wind, alcohol, spicy foods, heavy exercise, hot baths, heated beverages and irritating skin-care products. The most effective approach to treatment is combination therapy tailored to a patient’s individual needs. A treatment plan may include an anti-inflammatory skin regimen, sun protection, topical and oral prescription medications, and laser therapy. The National Rosacea Society website is an excellent resource for those wanting to learn more about this common condition. 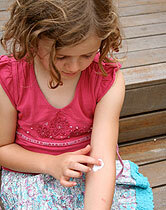 Atopic dermatitis, often called eczema, affects a substantial portion of the US population. The disease affects approximately 30 million Americans, including 10-20% of children. It typically begins in the first year of life and manifests as itch, redness, irritation, and chronic dry skin. Commonly affected areas are the face, scalp, and the folds of the elbows and knees. Atopic dermatitis is caused by an over-reactivity of the immune cells, which is probably influenced by both genetic and environmental factors. Asthma and hay fever (seasonal allergies), commonly occur together with eczema. Many, though not all, children outgrow symptoms of eczema by the time they reach adolescence, though the propensity for dry skin usually remains. Here at The Center for Dermatology and Laser Surgery we also treat different types of Eczema such as seborrheic dermatitis, contact dermatitis and others. Contact Us today for more information on Eczema. For any individual with eczema, the key to successful treatment is managing triggers and treating inflammation. Common triggers would be dry skin, stress, heat, sweating, environmental allergens, topical irritants and secondary infections. A diligent regimen of moisturization is always necessary to support the skin’s natural barrier function. Topical corticosteroids or calcineurin inhibitors aid in the treatment of rash. UVB light therapy may be useful to achieve control over larger areas of affected skin. For severe flares or chronic eczema, oral corticosteroids or immune modulating medications may be required. The National Eczema Association website contains a wealth of information for those suffering from eczema, or for the parents of children who are suffering from the disease.